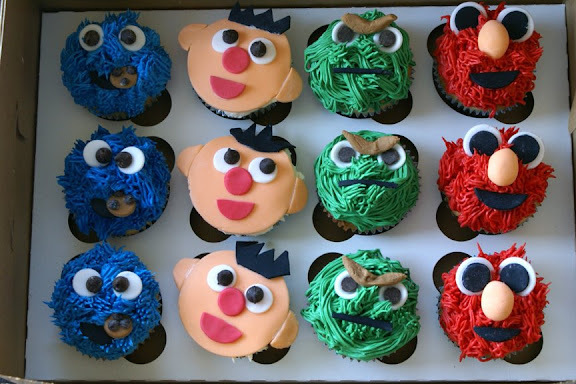 Take a little look at these nutty-faced Sesame Street themed cupcakes for a birthday party. 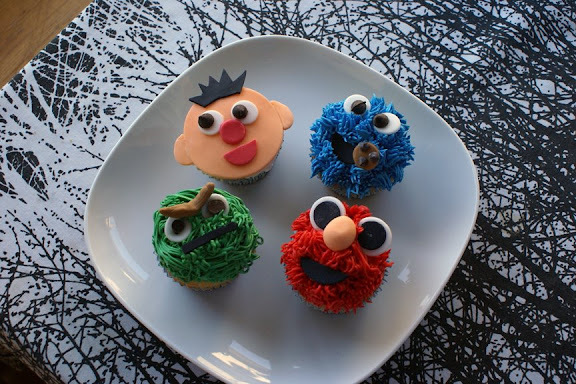 Cookie Monster, Elmo, Oscar the Grouch and Ernie! Cookie Monster is totally my fave Sesame Streeter so I was very excited to make him! Using my “hairy frosting tip”, I created a fuzzy looking Cookie Monster. Using fondant and chocolate chips, I made eyeballs, and for the MINI COOKIE I cut out a little brown fondant cookie and three MINI chocolate chips on each. CUTE! 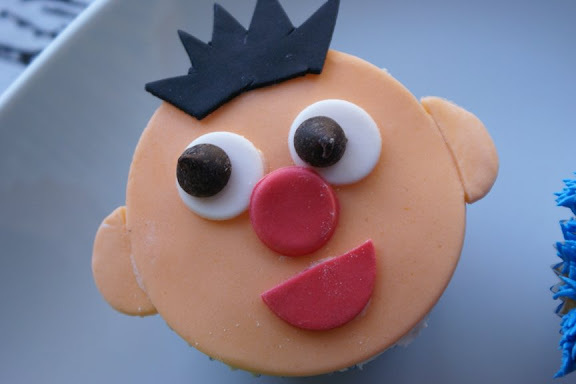 So I have a question for all my wonderful blog readers: which Sesame Street character is your favorite, and/or, which character do you identify with?? If Cookie Monster is my fave, do I think of myself as a googly eyed nutbar monster type who can’t help himself but gobble all cookies in his path?? Hmmmm… Well I do think of myself as a bit of a nut. I’m not a monster really but I am “alternative-type.” Do I gobble cookies? Sometimes I do. I actually LOVE COOKIES. Homemade ones. I try not to make cookies too often because I will eat so many of them. One winter, my old roommate Amber and I made nachos and cookies way too often. Eight pounds later, I had to hit the treadmill prettttttttyyy hard! Please do tell me which character is your fave!! And if you say Buffy St.Marie that’s okay too!! OMG…these are so cute! 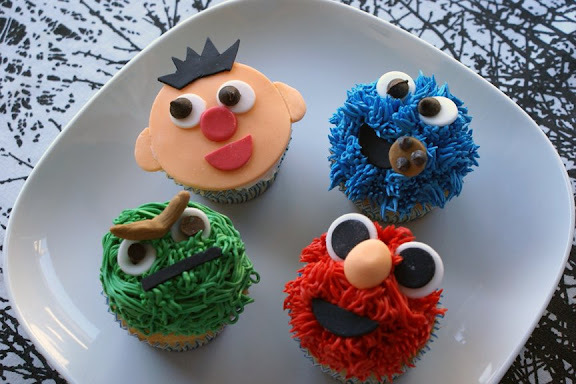 Love Sesame Street, and your cupcakes are perfect! I love all the characters, guess my favorite would have to be Ernie. 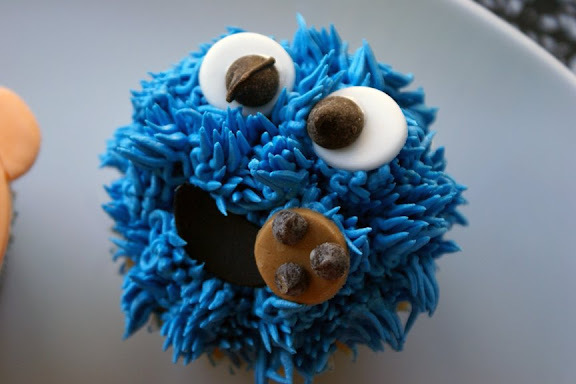 Love your sesame street cupcakes, your cookie monster one looks like a perfect likeness! When I was a kid I adored sesame street, I could probably sing the 1,2,3,4,5 number song off by heart! I think my favorite characters were Snuffy, and Slimey the worm. But there was also the Twiddlebug family that lived in the milk carton that I loved…oh, and the Count, Oh and I LOVED Barkly! haha, feeling all nostalgic now…might go watch some youtube clips! Love, love, LOVE your work of art!!! 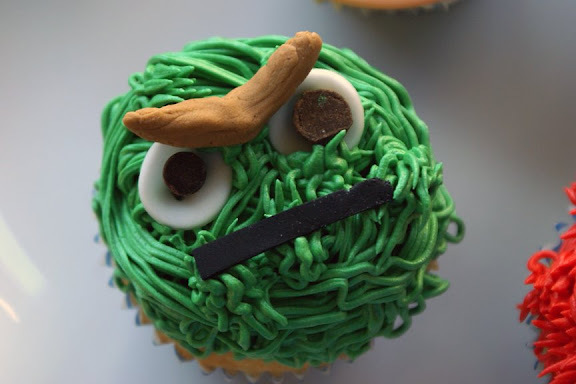 I have been following your blog since a friend showed me your creation of The Very Hungry Caterpillar cupcakes, knowing that I am such a cupcake fiend!! And cookies too! With that said I can identify with Cookie Monster! Gotta give props to the ever sassy Elmo and his ghetto-fabulous self! just when i think it can’t get any better… amazing! OMG! These are fantastic! How amazing. 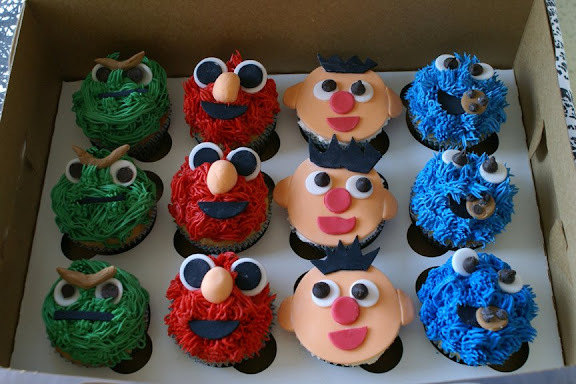 I am not such a Sesame Street fan, but I am fan of the cupcakes! Wow! Very cute! 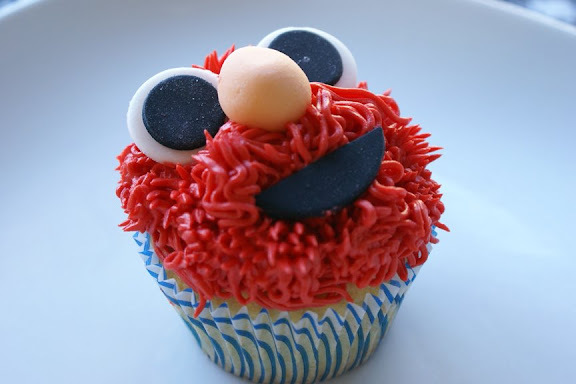 I would say Elmo… not sure he’s my likeness, I just think he’s the cutest and makes me laugh. You were very much missed at the BLIM Community Market yesterday, a number of people asked me if I knew where you were. Looks like you’ve been having a busy time lately. I rather like Oscar the Grouch, more because he’s green than a grouch! hah!! that’s awesome everyone!! love reading your comments. thank you so much! brian, i missed hawking my cupcakes this month, sadly next month i will not be there (though not sadly, i will be in europe! wheee!). thanks for your comment and see you soon! Hmmm…Main St or Europe? That must have been a tough decision! If you find yourself in London (my home town) you must go to Laduree in Burlington Arcade. It’s a tiny gold cavern filled with colourful, sweet macaroons…you won’t want to leave! These are great! I have to say Cookie is my main monster. Mmm cookie. The Buffy link, and other vintage Buffy links it led to, were golden. NO WAY, these are amazing! You cake queen, you! hi brian, thanks for the link! laduree, so dreamy… never been but my parents and sis have been there. we will be in germany and the netherlands visiting friends and family! and eating crazy foods too i hope! COOKIE MONSTER!!! How could there be a better character? I used to sing his song ALL the time! Would you mind sharing how you get such vibrant colors for your icing? I’ve been trying americolor, but mine just turn out pastel. these are awesome! have you guys ever done big bird cupcakes? These are amaze! Can you buy these anywhere? !